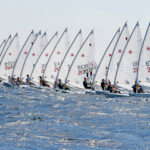 After 2 days waiting ashore, sailors completed 2-3 races today under medium to light winds, starting with 15 knots on first race, 10 knots on second and 6 on third. 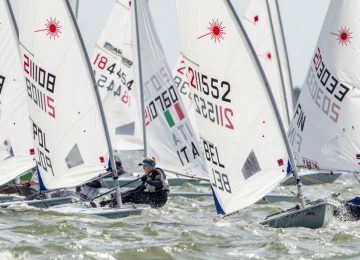 Maciej Grabowski POL (1-1-1) started with perfect score winning all 3 races and leading Standard Apprentice’s fleet. Maxim Semerkhanov RUS (2-3-2) and Adonis Bougiouris GRE (3-2-3) are close with 7 and 8 points respectively. Standard Masters are led by Brett Beyer AUS (2-3-4) with 9 points, closely followed by Peter Hurley USA (1-2-7) and Ernesto Rodriguez USA (4-1-5) with 10. Allan Clark CAN (3-1) leads Standard Grand Master’s fleet after 2 races with 4 units, followed by Tomas Nordqvist SWE (1-8) and Andy Roy CAN (5-4) with 9. The Standard Great Grand Masters are headed by Mark Bethwaite AUS (3-1), John Pitman NZL (1-3) and Michael Nissen GER (2-2), all with 4 points. 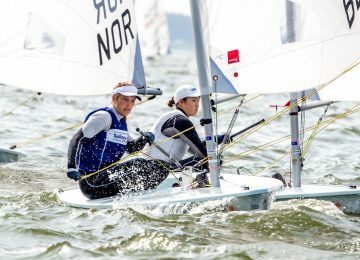 Jon Emmett GBR (1-1-3) leads the Radial Apprentices with 5 points, followed by first women Anastasia Chernova RUS (3-3-1) and David Waiting USA (2-5-4) with 7 and 11 points respectively. Radial Master’s fleet is headed by Alessio Marinelli ITA (4-2-1) with 7 units, escorted by Jean-Christophe Leydet FRA (7-1-2) and Scott Leith NZL (1-4-7) with 10 and 12 points respectively. Michelle Bain FRA (19-5-11) is leading RM women’s championship and ranked 10th overall with 35. 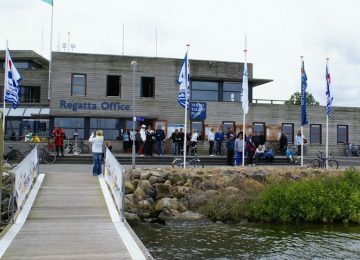 Rudolph Ratsep USA (7-1-9) was the best today among the Radial Grand Master sailors, leading fleet with 17 points. Second and third places for Martin White AUS (12-5-2) and Rob Cage GBR (16-4-8) with 19 and 28 points respectively. 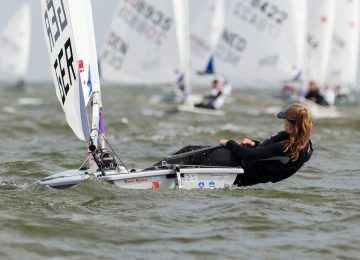 Lyndall Patterson AUS (25-2-14) is leading GM women’s fleet and ranked 9th overall with 41 units. Finally the Radial Great Grand Master’s fleet is led by Robert Lowndes AUS (1-11-1) with 13 points, followed by Kerry Waraker AUS (3-5-11) and Bill Symes USA (4-1-16) with 19 and 21. Hillary Thomas GBR (53-51-49) is first among GGM women and ranked 53rd overall. 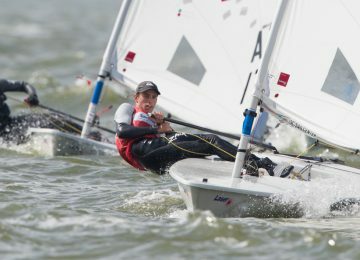 By Agustín Argüelles – EurILCA | Photo: 2017 Laser Worlds.